Keep twine handy no matter where you need it with this handy duo. 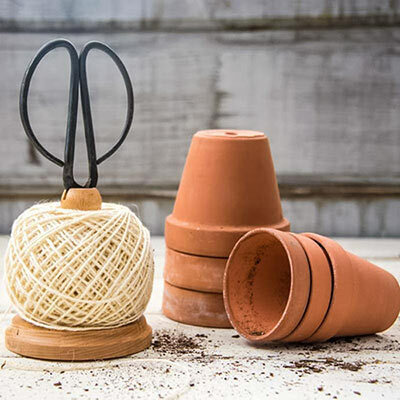 We've paired our sturdy iron garden shears with a whopping 328 feet of essential jute twine, and it's all perfectly put together on a beautiful beechwood base. 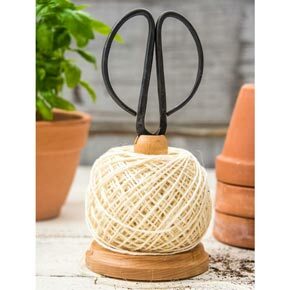 Ideal for use on a potting bench, in a garden shed or even in the kitchen, it's a convenient (and rustically appealing) way to keep both twine and snips nearby and at the ready. You'll never again need to stop what you're doing to go find scissors or string. Base fits most twine or jute balls. Our refills are available for easy reordering. 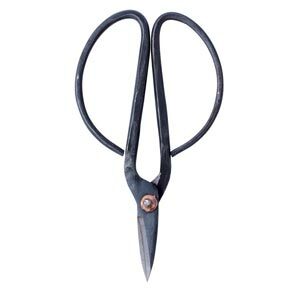 Overall: 9½"Hx4½"W, Scissors: 7"Lx3¾"W.